I’m sorry for the radio silence. My Dad and my uncle Doug came to visit for two weeeks, and we did so much that my blogging couldn’t possibly keep up. So here’s a round up of what we did, in no particular order. The Grand Palace is a complex which as served as the residence of the Siamese kings from 1782 until 1925. It is still used by the beloved Thai king, Bhumibol Adulyadej, or Rama IX, for official events (“Rama” is a title created for Thai kings so that Westerners would have a title they could understand and pronounce; it doesn’t actually mean anything in Thai). In the picture below, you can see the Temple of the Emerald Buddha, which is actually not a temple since no monks live there. The Grand Palace was swarming with tourists, and a fight nearly broke out between a Chinese woman and a British woman. I would have swung a fist for the British woman: the Chinese woman had put two hands on her back and shove her out of the way. All things considered, I think the British woman behaved with remarkable restraint. I negotiated that we would be allowed to stay at the Floating Market for an hour instead of an hour and a half. After I was done patting myself on the back, we got our boat, complete with two resident boats dogs. The Floating Market was a cornucopia of delicious-smelling seafood, curries, desserts and refreshing iced beverages. Although Doug did later tell me that he saw our cook washing the dishes in the canal, nobody got sick. At the end of the hour, we obedientaly lined up on the pier, waiting for our boat. Waited. Waited. Twenty minutes. Thirty. Then someone helpfully pointed out that our boat pilot was pulled off to the side, clearly working on the engine. He saw us looking and by sign language let us know we should just get in somebody else’s boat. It’s all the same route back to the dock, so it shouldn’t matter. Okay, we get in somebody’s else’s boat. But this boat doesn’t have a canopy. That’s disturbing. I try to let the sun touch my skin as little as possible, and an entire boat ride without a canopy does not line up with that goal. At about this time, our previous pilot has solved the problem and his boat is is up and running. So we let him know we’d rather be in that boat. The two boats line up next to each other in the river and we cross from one to the other. Question: Why did we get into a boat that we knew had engine problems? We make it most of the way back and then the engine clunks out. We’re left drifting in the middle of the very large Chao Phraya River in downtown Bangkok. Enormous barges are passing back and forth. Barges are heavy and not easily maneuverable. It’s up to a smaller boat to stay out of the way. Unless that smaller boat is having engine trouble. I kept a close eye on the barges. We drifted for maybe 45 minutes before another long-tail boat came, lashed itself to the side of our boat, and pushed us to the dock. We were pretty happy to get out of that boat. But at least it had a canopy. We also flew to Chiang Mai, in the north of Thailand. Now, I had been told that Chiang Mai was “in the mountains.” This was, at best, a statement made by someone who had no conception of what “mountain” meant and at worst a blatant lie. Chiang Mai lies at 1,000 feet of elevation. That’s not a mountain, that’s a hill. But, mountainous or not, Chiang Mai was still delightful. Among adventures chronicled in other posts, we also paid a visit to an orchid farm, the Chiang Mai Night Market, a Karen village and a monkey zoo. The Karen people are a large Sino-Tibetan ethnic group spread over Burma and northeastern Thailand. The origin of the Karen people is unknown, although their legends refer to a “a river of running sand” supposedly crossed by their ancestors, which could refer to the Gobi desert. The Karen are currently in conflict with the government of Burma, seeking their own sovereign status. As a result of the war, many have fled to Thailand. 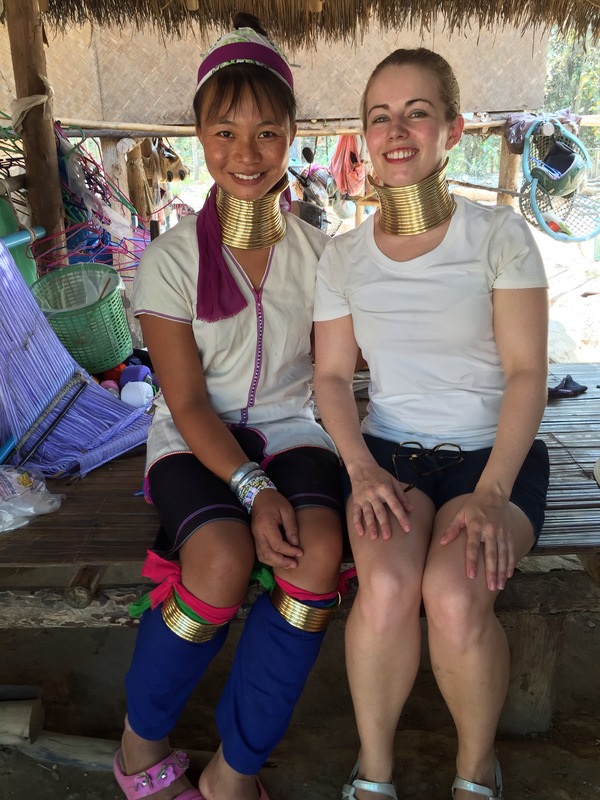 We visited the Padaung tribe, a subgroup famous for the elaborate neck rings they wear. The neck rings are made of brass and are extremely heavy. While they don’teactually stretch the neck, they do depress the collar bones and shoulder blade. Supposedly once a woman wears the neck rings for long enough, her neck can no longer support her head unassisted and she can’t take them off without risking a collapsed windpipe. This might be legend, though, as we saw women taking off their neck rings. As a final curious note, the signs at the village indicated that ne one knows what started the practice: it might have been for beautification according to the particular norms of that village or it might have been to make the women unattractive and therefore unappealing to slave traders. For some analysis on how tourism has affected the lives of these Karen people, go here. Unfortunately I didn’t see this post until after I’d already visited; I don’t know if I would have chosen to go otherwise.